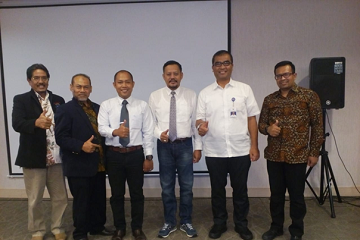 Bogor Agricultural University (IPB) Center for Coastal and Marine Resources Studies (PKSPL) together with the Directorate General of Sea Transportation (Dirjen Hubla), the Ministry of Transportation's Directorate of Ports held a training and Port Expert Education. This training was held at Novotel, Jakarta (8-12 / 10). In his remarks, Director General (Dirjen) Hubla, Ir. R. Agus H. Purnomo said that this activity could provide tangible benefits for the establishment of quality human resources (HR) of sea transportation, especially in the field of ports for the creation of a reliable, competitive and added value port system. "This activity is very important considering that Indonesia is a maritime country that needs reliable human resources based on scientific analysis and sitesis. Able to adapt quickly to the times. It cannot be denied that HR elements are important in implementing all forms of transformation. "Hopefully there will be capable human resources and be able to answer all challenges and changes in port management and management in Indonesia," he said. According to him, the challenges ahead in the development of ports are how ports can synergize with the industrial world so that the role of ports can be optimized, especially in reducing national logistics costs. In addition, the role of port managers can also adjust to current conditions in the context of digitalization. Meanwhile, Head of PKSPL IPB, Dr. Ario Damar said that as a global maritime axis, Indonesia absolutely needs reliable human resources in the port sector. The Nusantara Sea Toll Network launched by President Jokowi is also absolute, in addition to requiring physical infrastructure development, it also requires the development of reliable human resources who are able to guard all parallel physical hardware prepared. "PKSPL IPB not only develops human resources in the form of Quick Education (Training) and Training, we also carry out scientific education at the undergraduate, master and doctoral levels. We have also conducted training with the cooperation of world famous ports and international maritime institutions such as IMO, Bremen Port, Shanghai Maritime University, WMU Sweden, whose meeting is in the framework of developing reliable human resource capabilities in the fields of port, shipping and logistics, " he said. This training was attended by 37 people consisting of various port stakeholders from the government and from the private sector. This training will later get a port expert certificate signed by the Director General of Sea Transportation in accordance with applicable requirements. This activity is based on the existence of Law No. 17/2008 concerning Shipping and Government Regulation No. 61 of 2009 concerning Seaport. This law has provided a great opportunity for companies engaged in port to be able to develop businesses that are efficient, comfortable, safe and able to provide excellent services in goods and services distribution, and passengers. The mandate of Law 17/2008 and PP 61/2009 is expected to encourage national economic growth in order to improve the welfare of the people throughout the archipelago.